Drams six and seven come as a pair, hailing as they do from the same distillery. But again I’m eschewing whiskies for something else. This time vodkas, namely Żubrówka Biala and Żubrówka Palona. There’s not much information in English on these vodkas, unfortunately. Neither is widely available in the UK as yet (although look here), although they can be picked up in duty free at Polish airports. Which is where these came from, care of friends who regularly visit the country. However, while the vodkas under scrutiny are not well known outside their homeland, the Żubrówka name is already rightly famous among vodka lovers worldwide. After all, it’s the brand most synonymous with the idea of infusing the spirit with a tincture made from the aromatic grass Hierochloe odorata, commonly known as bison grass because of its association with the rare European Bison (żubr means bison in Polish). This results in a yellow-green tinged, almondy concoction that mixes brilliantly with apple juice, as well as providing a great base for interesting cocktails. But these vodkas aren’t made with bison grass, so what are they? As I understand it, these new Żubrówkas are, to some extent, a consequence of the de-nationalisation of Polish vodka making after the fall of the Soviet Union. Where once the state controlled both production and brands, meaning that any Polish vodka brand could in theory be produced at any distillery, or “polmos”, in their control (although in practice specific brands were often associated with specific distilleries), today these same distilleries seek their own identities through distinct brands. Thus Polmos Bialystok (now part of vodka giant CEDC Group), the distillery most associated with Żubrówka and now the owner of that brand in Poland (other “Zubrowkas” are still made in Russia and Belarus), has begun a line extension of its best known product. Moving the other way, Polmos Poznań, long time producer of the classic rye-based white vodka Wyborowa (and now owned by Pernod Ricard), now has a grass-infused vodka in its armoury as part of its “Oddka” range, among other flavoured variations. There are other examples and also many entirely new brands. 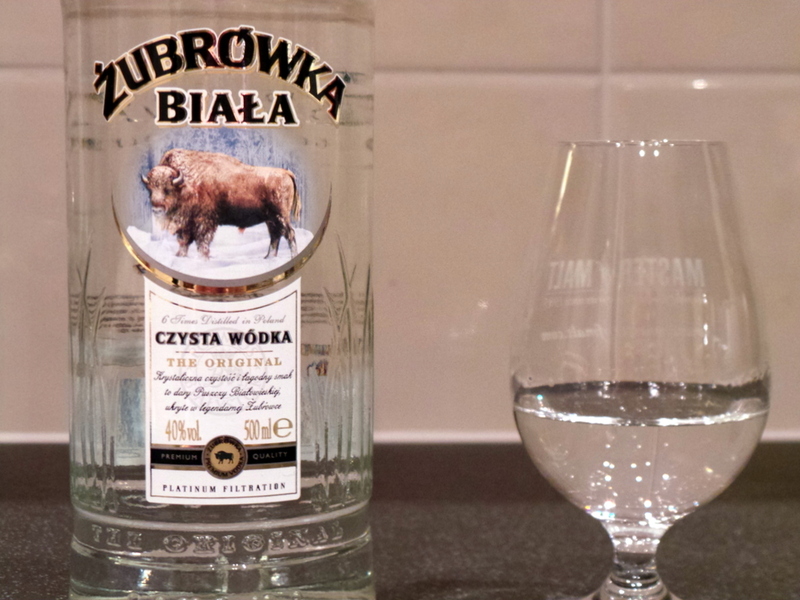 Back to our current wards, Żubrówka Biala (40%), the white spirit, is effectively the original Żubrówka minus the bison grass. What’s left is a good example of a rye-based vodka that can warrant drinking neat. The (predictably) spirity nose conjures up fresh washing on the line, while the palate is creamy but somewhat dry. Żubrówka Palona (34%), the brown spirit, is perhaps the more interesting of the two being a rare example of a Polish oak-aged vodka (the traditional and extremely woody Starka being an exception) and therefore potentially challenging the distinction between vodka and whisky. Perhaps avoiding this potential for confusion is the reason for the reduced strength of the spirit, which hits the scales at a modest 34%. Maybe. but in reality it’s rather more distinct anyway. 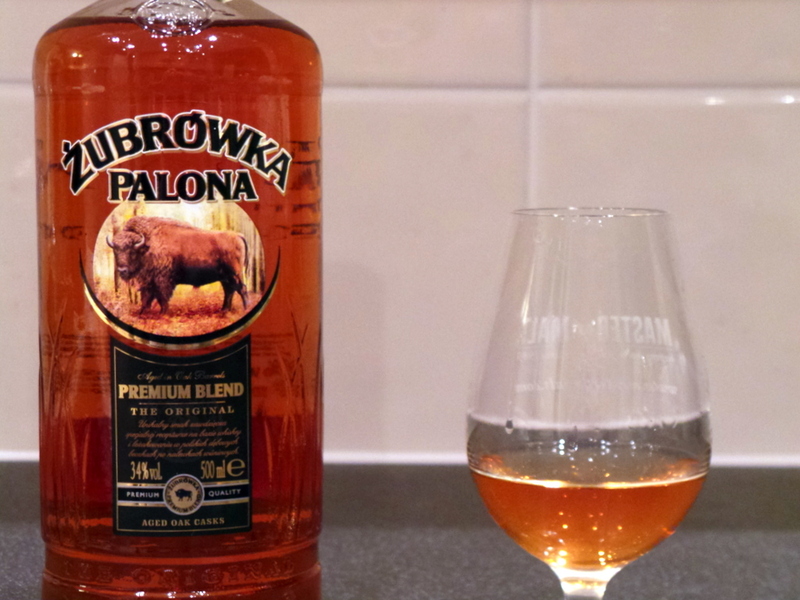 According to the press release accompanying its launch in May 2012, Żubrówka Palona is made according to a “unique recipe, using … whiskey as an ingredient” and aged “in Polish oak casks previously containing cherry tinctures”. However, that doesn’t prepare you for the reality. To sample, Żubrówka Palona is unique, nosing and tasting almost exactly like a rich, alcoholic, liquid Cherry Bakewell, full of almonds, jam, franjipan and glace cherry. It’s really rather moreish and, now that it’s open, unlikely to last beyond Christmas. Both vodkas come in a stylish bottle designed by Claessens International that are a marked improvement on the current bottle used for Żubrówka Bison Grass vodka in markets such as the UK. With the continuing popularity of vodka around the world, and a revival of interest in brown spirits, maybe it’s time for Żubrówka to show off its new colours to a larger audience.